Q: Our cats are climbing on the dinner table and disturbing us while we eat. 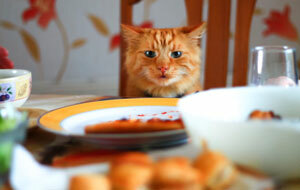 How can we use clicker training to keep the cats away from the table when food is around? A: With clicker training, and any behavior-modification program, it is far easier to teach an animal what you want it to do than try to stop the unwanted behavior by focusing on it. If your cats have been able successful getting food from the table, that behavior is very reinforcing for them. First ask yourself what you want the cats to do instead of climbing on the table—focus on that alternative. One really nice possibility is to keep the cats busy with enrichment toys or food toys, such as the ones found here. Cat Kongs can be stuffed for cats to enjoy on the floor during mealtimes. Some food puzzles, like the Nina Ottosson Treat Maze, have been designed for dogs, but are small enough for cats to play with as well. If you catch your cats on the table, use your target hand or a target to redirect them off the table (see How to Teach Your Pet to Target). When the cats have followed your hand and are off the table, redirect them to another activity. Help Your Dog Keep His Cool!